Web accessibility is about giving everyone access to the same information, regardless of the impairments users may have. There are four loosely grouped types of disabilities, which can be either temporary or permanent: physical (such as paralysis or fine motor control issues), sensory (such as autism, deafness, or blindness), intellectual (such as Down syndrome or developmental delays), and mental illness (including schizophrenia and depression). Many senior citizens have issues that go along with getting older and can also benefit from accessibility accommodations. It’s vital not to underestimate the importance of web accessibility. While 20 years ago the internet was a place for tech geeks, it is now a primary source of information, entertainment, and communication. It’s used for everything from shopping to sharing moments with friends, reading the news, watching TV shows, applying for jobs, booking vacations, and more. Yet, for people with disabilities, there are barriers in place that make many of these things inaccessible, as many websites don’t consider their needs. Much of the internet is not yet treated as a public space and does not ensure access to everyone regardless of ability. While it is true that full accessibility requires designers to follow several strict guidelines that may impact the overall look and feel of a website or application, some improvements—such as providing alternative text descriptions for images—won’t have a noticeable effect on the user interface. With today’s technology, it’s completely possible to create a trendy, interactive, engaging, and accessible website; therefore, web accessibility should no longer be seen as a burden. Besides, there are plenty of ugly non-accessible websites, too! It’s true that incorporating accessibility is not always an easy thing and will probably increase the time spent on the conception and development phases of a website or application. However, it will reduce time spent on site improvements and technical repairs: cleaner code, fewer bugs. Thinking of accessibility right from the beginning of a digital project will also help curb later costs, including maintenance and customer support. From an SEO perspective, an accessible website will also help get better rankings. Search engines such as Google operate much like a blind person using a screen reader. When scanning your pages, robots only understand text, so it’s important to plan your content architecture and headings and provide alternative text for images. This argument tends to be the main one for companies and design agencies who don’t want to invest time or money in order to make a website accessible. When looking at their data, it appears that people with disabilities don’t even visit their website. (Oh, the irony! How could they if it’s not accessible to them?) They are also convinced that the market is way too small to matter anyway. People with major impairments might be a small part of their audience, but what about senior users? What about users who have what are considered “minor” impairments, such as those who are hard-of-hearing or colorblind? What about the average user suffering from a debilitating migraine and unable to stand bright colors or infinitely scrolling pages written in 11px type? Lots of users who wouldn’t be considered “traditionally” disabled may suffer from a non-accessible website. On the other hand, just as in real life, making technology accessible benefits everyone. Consider captions for TV in a noisy bar or wheelchair ramps for strollers. Well, actually, it’s not. In many countries, there are laws making it illegal to discriminate against people with disabilities when providing a service or product. So, in theory, if a user with a disability can’t access content because a website isn’t accessible, they could legitimately sue for digital discrimination. And these lawsuits are happening with greater frequency every year, often costing companies millions of dollars to settle. In the US, accessibility requirements are listed in the Americans with Disabilities Act, enacted in 1990. Back then, it mostly concerned physical stores, so courts have been divided about whether or not websites and applications should be covered. In 2017, over 800 lawsuits were filed in federal court in the US alone, so the threat of litigation is real. While Facebook has been praised for its Empathy Lab and policies regarding accessibility, other companies have not been so lucky. Netflix has been sued several times by different associations for the blind and deaf. 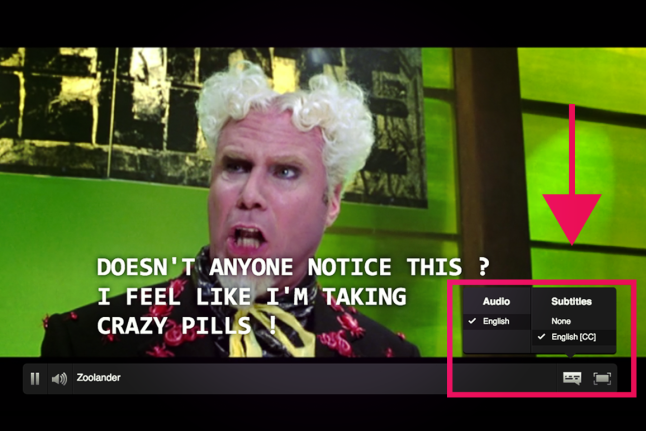 In the end, they had to provide equal access to its content to all users, including adding subtitles to all of its programs. Sued by several associations for deaf users, Netflix agreed to provide closed captions to all its content. Companies who embrace people with impairments only benefit from it. Efforts to make a website or app fully accessible have a positive impact on a reputation and create an image of social responsibility and care for all users. In the process of adding accessibility features, Silicon Valley giants don’t hesitate to bring innovation to the game, investing millions in tech and ground-breaking new features. For example, Facebook is now using artificial intelligence to provide its blind users automatic alternative text through object recognition technology. This feature now allows them to fully enjoy the 2 billion pictures shared each day on Facebook. The idea mostly came from Matt King, a blind software engineer working with the accessibility team. Facebook has shown commitment to being a friendly company for people with disabilities, both online and in the physical world. 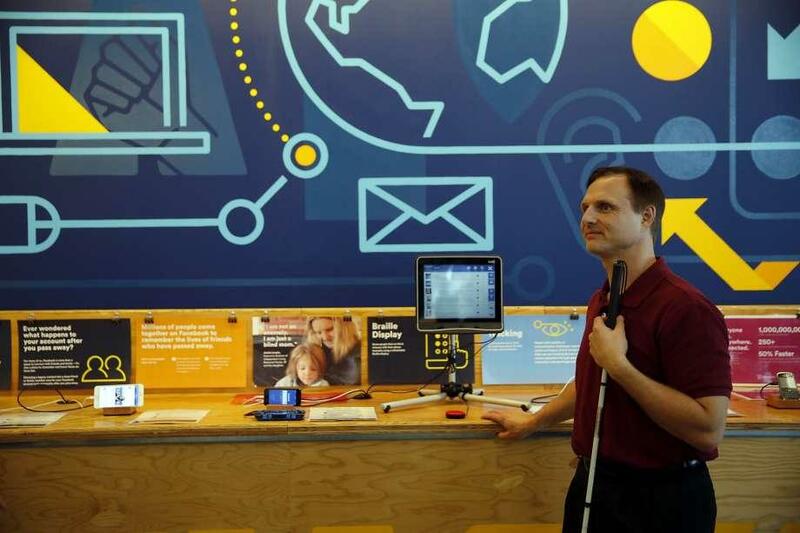 Matt King, a blind software engineer working at the Facebook Empathy Lab. More than 80% of people with impairments have decided not to trust a service provider because of barriers, poor web accessibility being one of the top reasons. As they are often ignored by most brands, users with disabilities are willing to spend more of their money with companies who provide them with a well-thought-out user experience. The purchasing power of this particular market is enormous. Accessibility improvements won’t turn away your current customers but will attract new customers and improve your conversions. By acknowledging users with impairments, you’re letting them know that their rights matter, and that their business is valued. There are many different permanent and temporary disabilities, with users facing different challenges and seeking different solutions. In order to offer the same content to everyone, you need to address every need. Sight and hearing problems are the most common sensory disabilities, but there are a number of other impairments that are also affected: seniors, those who are color blind or hard of hearing, and many autistic users. For users with hearing impairments, one step toward making your website or app accessible would be to implement text transcripts and video captioning. Not only are they a must for the deaf, but they are also useful for the hearing. A study on accessibility by Ofcom found out that 80% of people who use closed captions are neither deaf nor hard of hearing. It’s a typical example of an accessible feature benefiting everyone. Regarding visual impairments, most guidelines also help every type of user. Whether you are colorblind or suffering from a migraine, you’ll thank a designer for using contrasting colors (text and background). Everyone will benefit from bigger, relative font sizes (em, not pixels) and the option to adjust the size, a feature particularly appreciated by senior users. As for blind users, though they may not see a website they’ll hear it, thanks to screen readers like JAWS and Window-Eyes for Windows and VoiceOver for Mac. Such programs read content aloud…and they read it ALL. To make it easier to navigate through your pages, be sure to use “Skip to main content” options to prevent having the whole navigation menu read several times in a row. Correctly structure your page using different headings (only one <h1>, then do not skip levels), include text descriptions for every image, avoid complex tables, and carefully pick your text hyperlinks. They should properly describe where the link will go: Using just “click here” is ineffective for a screen reader user as it doesn’t give any relevant information. VoiceOver for Mac gives auditory descriptions of each on-screen element. Some users may be permanently or temporarily unable to use a mouse or trackpad. Therefore, they can only use their keyboard to browse a site, pressing the “tab” or “arrow” keys. Ensuring that a website can be fully experienced only using a keyboard is one of the easiest and cheapest features to implement in web accessibility: It requires little work and can be checked by simply unplugging or turning off your mouse. Browsers will automatically select clickable items on a web page by pressing the TAB key, which greatly helps accessibility, so be sure the development team does not turn it off. Users with learning disabilities, Down syndrome, ADHD, dyslexia, and other cognitive impairments, including those that sometimes happen as users get older, will benefit greatly from clear content and a consistent UI. Therefore, try to build a logical interface (similar colors for similar actions, a combination of fonts, simple animations, visual hints when asked to participate, etc.) and organize your content using headings to quickly identify its different parts. Setting rules and patterns and following defined design principles will help users get around faster and avoid surprises in the navigation experience, thus making it smoother and more understandable overall. Simplifying and standardizing the UI of a site or application tends to lead to a better user experience for all users. There are international guidelines for creating accessible websites readily available: the Web Content Accessibility Guidelines (WCAG). Developed through the W3C process, the WCAG (currently WCAG 2.0) provides a single shared standard for web content accessibility. Primarily intended for developers, designers, and accessibility experts, all WCAG documents explain how to make a website more accessible and are organized under four principles: perceivable, operable, understandable, and robust. This set of recommendations allows you to reach a level of conformance (A-minimal, AA-satisfying or AAA-excellent). Implementing all of the WCAG standards will take time but starting with the basics can make a huge impact on making your website more friendly to users with a variety of impairments. There are tools available online to check if a website meets accessibility guidelines, such as the official validator from W3c. Be aware that online tools may not find all accessibility issues, as they primarily check the technical aspects of a website. Using assistive technology, such as a screen reader to test a website is an important step in ensuring a website is truly accessible. However, while these are both affordable places to start, they will never replace actual user feedback. It’s important to have users with various impairments included in the user testing process if accessibility is sincerely considered a priority. Including people with disabilities in the UX testing process for any new website or app before launch is key. They’ll give the most relevant feedback on whether or not their user experience is actually enjoyable. Work hand in hand with a trusted UX designer who will prepare testing scenarios depending on different impairments. Accessibility is a major issue that looms larger as more of everyday life happens online and as the world’s population grows and ages. By 2050, the aging world population is expected to double. That shift in demographics means many impairments that go hand in hand with age will increase. It’s not a simple task, but companies who continue to ignore accessibility need to understand that they are already losing customers and that they’ll end up losing even more in the coming years, considerably reducing their revenues as a consequence. In a world that has made progress recognizing other minorities, denying that accessibility rights are human rights will also damage their public image and reputation. With that in mind, the sooner a company embraces accessibility as a key value in creating a website or app, the sooner they’ll be recognized as a company that doesn’t neglect disabled users. They’ll get more traffic and, in turn, likely more conversions. Recognizing the importance of web accessibility is a win-win situation. User accessibility is the practice of removing barriers from websites that could hinder functionality for users with sensory, physical, and cognitive disabilities. It includes things like adding closed captions to videos and making sure there is enough contrast between elements for users with vision impairments. Why is it important to make a website accessible? The web is meant to work for all people, regardless of disabilities or impairments. When websites aren’t accessible, they cut off access to significant numbers of visitors. Web accessibility can also be a legal issue for companies who don’t comply with Web Content Accessibility Guidelines (WCAG). What is the definition of accessible design? Accessible design is the practice of removing barriers from websites that could hinder functionality for users with sensory, physical, and cognitive disabilities, including initiatives like ensuring adequate visual contrast for users with vision impairments and adding closed captions to videos. I politely disagree with your statement to "Work hand in hand with a trusted ux designer who will prepare testing scenarios depending on different impairments." Rather, I would contend that it's imperative to work with a formally trained RESEARCHER, ideally someone with a Ph.D. Accessibility Testing introduces nuances that are best addressed by individuals with a formal grounding in both Experimentation Methodology and the Ethical Treatment of Human Subjects. Simply put, there's a reason that companies such as Microsoft, Google, Amazon, and Facebook abide by the premise that formally trained designers engage in Design Activities, and formally trained researchers engage in Conducting Research. Laura is a senior UX/UI designer with eight years of experience. Her expertise is wanted on B2C and B2B projects (website, app, ERP, and more). To increase engagement and conversion rates, Laura conceives meaningful experiences that meet both your needs and your users' interests; then she uses her creative skills to design modern interfaces that perfectly match your branding. Laura also teaches UX for eCommerce at Université de Rennes 1, France.